"I think that is important, that this is a work that must be done as a work of faith and sharing that faith with others." 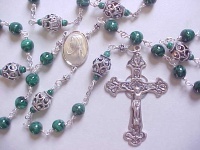 Lottie Dorsey of magnificatrosaries.com has been creating beautiful handmade rosaries since 1992. She is a former teacher, a convert to the Catholic Faith, a member of the Catholic Daughters and helps with religious articles sales at her parish. She also donates beads to two monasteries where the nuns make rosaries for their gift shop as a means of supporting themselves, and to local ministries that go to Haiti and Cuba. You are a convert to the Catholic faith. In what way did the Rosary play a role in your conversion and faith journey? 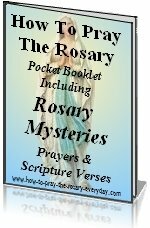 I decided to learn to pray the Rosary and pray it every day during Lent in preparation for being received into the Catholic Church at Easter Vigil in 1992.As a new Catholic, I wanted a rosary where I could tell the difference between where to say "Hail Mary" and where to say "Our Father". When I couldn't find what I was looking for, I decided to try making my own. So many people who saw mine wanted me to make one for them that I decided to make them as a fund-raiser for the parish that had brought me into the faith. It was so popular that I continued to do fundraisers for my parish throughout the years. In what ways have you seen the power of the Rosary demonstrated in your life and how did it affect your decision to start selling rosaries online? There have been many times in my life that I have turned to the Rosary when I needed guidance and in the peace of meditating on the joys and sorrows of Jesus' life, often found direction for my own life. 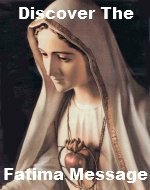 In 2002, while praying the rosary I "felt" the Blessed Mother tell me, "For 10 years you have given it all to me, now let me take care of you". At the time, I did not know what she meant. I didnt think I needed taking care of. However, I did feel a strong directive to begin marketing my rosaries outside of my own parish and so I put up a web site, and named it after the prayer spoken by Mary when Elizabeth acknowledged her as the mother of the Savior: "My soul magnifies the Lord; And my spirit rejoices in God my Savior...", one of the few times that Our Mother is quoted in the Bible. In what ways did you see God's hand play a role in your business? Shortly after I had put up my website, I began to experience various health problems to the point that finally I could no longer work a regular job. I didn't qualify for retirement immediately, but when my sick leave ran out, God provided for me by suddenly bringing a lot of business to my website. It brought back to mind the message I had felt from the Blessed Mother, that it was time for me to let her take care of me. I still think of my business partly as ministry. I think that is important, that this is a work that must be done as a work of faith and sharing that faith with others. Many customers ask me to pray for them, and offer to pray for me. What materials do you prefer to make your rosaries out of and why? I prefer to make rosaries with natural gemstones and freshwater cultured pearls because they are God's own art work, and they remind me of what the priest says at the Consecration, "which earth has given and human hands have made". I also like to make the Our Father beads (Paters) very special, with hand made lampworked glass, with the designs worked entirely in colored glass, not paint, hand carved bone and shell, or exquisite hand crafted sterling silver beads from Bali and Thai Hill Tribes. I sometimes use as many as 9 components to form an Artisan Pater - including hand made sterling silver caps, daisy spacers and tiny gemstone, pearl or crystal accent beads. I've chosen the most beautiful and unusual sterling silver crucifixes and rosary centers I could find. These components are made two different ways - die struck and laser engraved or hand cast from vintage rosary parts. Since the Rosary is in honor of the Blessed Mother and to the Glory of God, it seems fitting to use the beauty of nature that God has given us and accent them with hand made treasures from around the world. What types of construction do you use in making your rosaries? 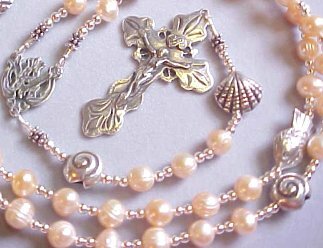 On my sterling silver Designer Rosaries, I use two techniques that are very sturdy. The first is wire wrapping with sterling silver wire, which looks similar to chain linked rosaries but instead of just closing the loop, the wire wraps around itself a couple times so that it cannot come unhooked. The second is beading on flexwire, a professional grade jewelers cable, with Sterling Silver spacer beads in place of traditional links and chain. I also make less expensive rosaries with traditional wire links, but with heavier wire than store bought rosaries. What special occasion rosary beads do you sell? 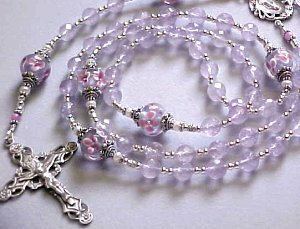 First Communion and Confirmation are two of the most popular special occasions I make rosaries for. Many parents want their child's rosary to last them a lifetime, to be something that they will use well beyond childhood and that they will one day be able to pass down to their child. Store bought rosaries are cheaply made and fall apart. I also make Family Birthstone rosaries. Each one is different depending on the number of people in the family. Customers like being able to have a birthstone rosary made with real stones rather than colored glass. I also get requests for Mothers Day, Fathers Day, Weddings, Baptisms, Christmas gifts and many other occasions that are special to individual customers. 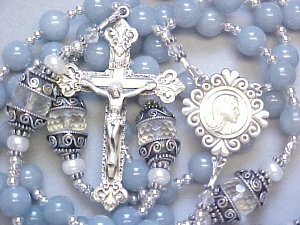 Check out Lottie's beautiful, high quality rosary beads at Magnificatrosaries.com and support this handmade rosary designer! Do you have a great story about this Rosary promoter? Please share it here! 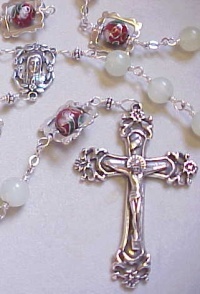 Click below to see contributions from other visitors to Magnifcatrosaries.com page. If you would like to contribute, please use the submission form here. Lottie Is A Wonderful Woman...And Rosary Maker! Return from MagnificatRosaries page to our Home page.